Wow! Always challenging our daring bakers contests!!! I made bagels just once in my life, few month ago, and I was ready to try a new recipe and give it another chance to improve! And this recipe, even if in mammoth proportions, is wonderful! Luckily I made them for friends coming over, so they were just enough! First of all, as the rules weren’t allowing the use of a mixer, I knead by hand the dough. So, let’s think, since how many years I haven’t knead by hand??? To many for sure! Kneading is a wonderful exercise, for mind, muscle and soul. When I’m stressed, or sad, or I don’t fill all my self, I make something yeasty and fluffy, but I don’t knead any more… Mainly because three years a go I kneaded so hard a bread that my wrists began to hurt, so I began to use the mixer. But now, years later and old stress free, I knead again, and I’m so happy!!! 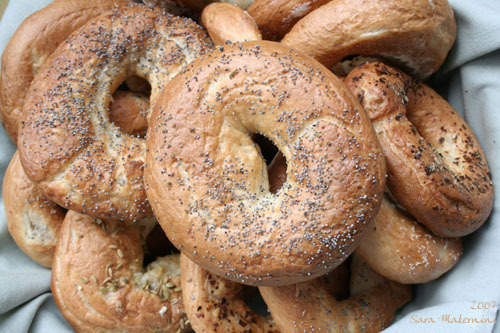 Bagels for ever and ever! I think your bagels look great. And I love your rhyme. You are just too cool! These look wonderful Sara! Well done! Way cool! and looking great while being cool. Yours are not ugly, not one bit. They look crisp and golden brown and ready for some good spreads. What? Ugly? No way! Yours look great! Sara, your bagels are cool, too!! I love the theme song AND your bagels are not ugly. They war exactly what a bagel is suppose to be! Great job!! Those bagels definitely rock, rule and are very cool! Well done! Great job, Sara! I love your bagels, they don’t look ugly at all! Congrats on job (and rhyme!) well done! Knead and bake is perfect remedy for any bad day! That’s a wonderful Daring Bakers Theme song! Your bagels are beautiful Sara! Yes, I like your idea of “knead and bake” as our theme. Your bagels don’t look ugly at all, they look wonderful! Bravissima, Piperita! I love your bagels! Ladies, thank you very much for all this compliments!!! But I can assure you that thos two bagels you can see in the pictures are the nice ones… All the others are hidden!!! In the week-end I’ll try to look at all your bagels creations!!! Remember, when life is hard and you don’t know what to do, KNEAD AND BAKE!!! I love that!! Think it should be posted on my wall. 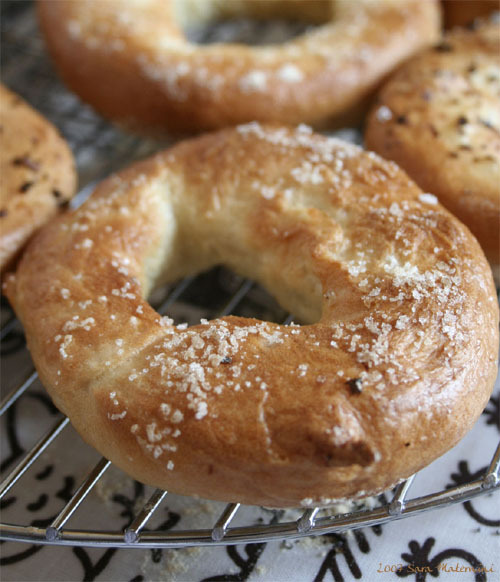 Great post and your bagels look golden brown and wonderful. I agree, when life is tough…knead and bake! Great job on your bagels. Your bagels look just fine! I think your bagels look great! It’s the taste that matters anyways right? 🙂 Kneading makes me nervous so I try to avoid it. hehe.